baking | Blog, Jane! Blog! So you know I’m on this new eating better kick, right? I’m doing pretty good, too. Especially if you don’t count yesterday… So I have been playing around with some recipes to make them better. Like adding healthy fats (flax seed) and eliminating corn syrup. 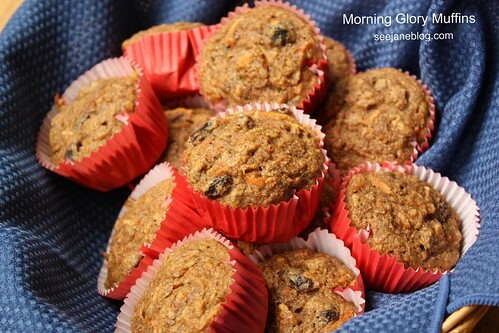 So I took my favorite Morning Glory Muffin recipe and doctored it a bit to reduce some of that “bad” stuff. 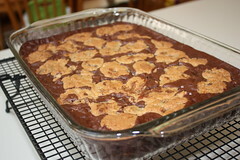 Here’s the yumminess I came up with. Preheat oven to 375 degrees F (190 degrees C). Lightly oil 24 muffin cups, or coat with nonstick cooking spray. Put raisins in a microwave safe bowl. Cover with water and microwave for 1 minute. (Or cover with HOT water) This step plumps them up. In a medium bowl, whisk together eggs, applesauce, honey and vanilla. In a large bowl, stir together flours, ground flax seed, cinnamon, ground cloves, baking powder, baking soda and salt. Drain raisins. Stir in carrots, apples and raisins. Stir in applesauce mixture until just moistened. Spoon the batter into the prepared muffin cups, filling them about 3/4 full. I had some very ripe bananas and a half bag of cinnamon chips, and wanted to put them together into scrumptiousness… this is what I found. YUM!!! I had chili on the menu for Sunday and decided to try making some cornbread muffins. I love cornbread and figured it was the perfect compliment for chili. These were definitely good and very easy! In a large bowl, cream together butter, sugar, honey, eggs and salt. 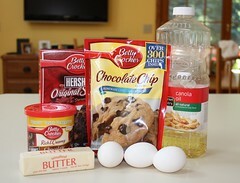 Mix in flour, cornmeal and baking powder; blend thoroughly. Stir in milk and corn. Pour or spoon batter into prepared muffin cups. I found this apple cake recipe a few weeks ago, but didn’t get around to making the cake until this weekend. I decided to make a cream cheese frosting (found in my America’s Test Kitchen cookbook) instead of the streusel topping, and let me just say it was AWESOME!!! Also, note that I don’t know why you’d beat the eggs for 15 minutes, but I did it, because several reviews said you needed to… One of the few times I wish I had a stand mixer. *Struesel Topping: Instead of frosting, mix 4 tsp white sugar with 1 tsp ground cinnamon, sprinkle over cake prior to baking. 5 seconds, scraping down bowl with rubber spatula as needed. They were very good. Very easy! I didn’t add nuts. I will make again! 1. Heat oven to 350°F. In large bowl, stir brown sugar and butter until blended. Stir in vanilla and egg until light and fluffy. Stir in oats, flour, baking soda and salt; stir in chocolate chips and nuts. 3. Bake 9 to 11 minutes or until golden brown. Cool slightly; remove from cookie sheet to wire rack. I tried a new frosting for Elizabeth’s birthday cake. 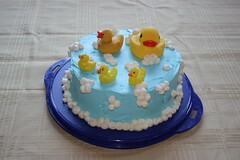 I wanted something that went on more smoothly than the Wilton’s buttercream recipe. This worked really well for the smooth frosting, and it was delicious! It did however get really melty quickly when I piped on the bubbles. It was fine for this cake because I didn’t have a lot of piping to do. 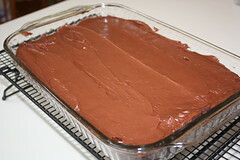 So overall, if I’m doing a whole bunch of piping, I’d do the Wilton recipe, but if I want to spread a smooth cake, I’ll use this recipe found at allrecipes.com. I quadrupled the recipe, but a triple recipe would have been plenty for this cake and the dozen cupcakes I made. Cream room temperature butter with a hand mixer, the paddle attachment of a stand mixer, or a wooden spoon until smooth and fluffy. Gradually beat in confectioners’ sugar until fully incorporated. Beat in vanilla extract. Pour in milk and beat for an additional 3-4 minutes. Add food coloring, if using, and beat for thirty seconds until smooth or until desired color is reached. Last week’s theme for Whip It Up was “Guilty Pleasure”. And I thought these brownies fit the description perfectly!! Yes! Basically following directions on the back of 2 boxes! Not too difficult at all! Ummm??? 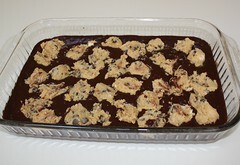 Chocolate Chip Cookie on top of a Brownie with Chocolate Frosting… Yummy! 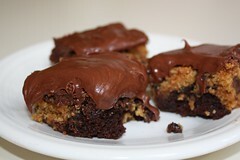 They were especially good when they were warm and a bit gooey and the frosting was melty! Most definitely. Easy to take somewhere and I think you could guarantee an empty pan at most functions!